Relocating to Braidwood, I’ve been slowly getting more acquainted with some of the artists working in the region (and there are A LOT). Most recently I’ve been getting to know the work of Lizzie Hall, and following the development of her exhibition Shelter Object which opens at Canberra Contemporary Art Space Manuka next week. Here’s a piece I wrote after spending time with her in her studio. Looking forward to seeing the show, and I think you ought to take a look too – Sept 17 to 27. This kind of thing doesn’t come around every day. Shelter Object borrows its name from the concrete structure built to encase part of the Chernobyl Nuclear Power Plant, following the disaster of 1986. Its purpose was to seal the plant’s most dangerous areas, preventing radioactive contamination of the environment, keeping the poison from coming out. Lizzie Hall’s Shelter Object has an unusual structural composition – Weet-bix bricks. The familiar contents of the breakfast cereal package have been crushed, pulped, mixed with glue and cast in molds. Reconstituted, the fragile biscuits meld easily into a dense, monotonous bulk. 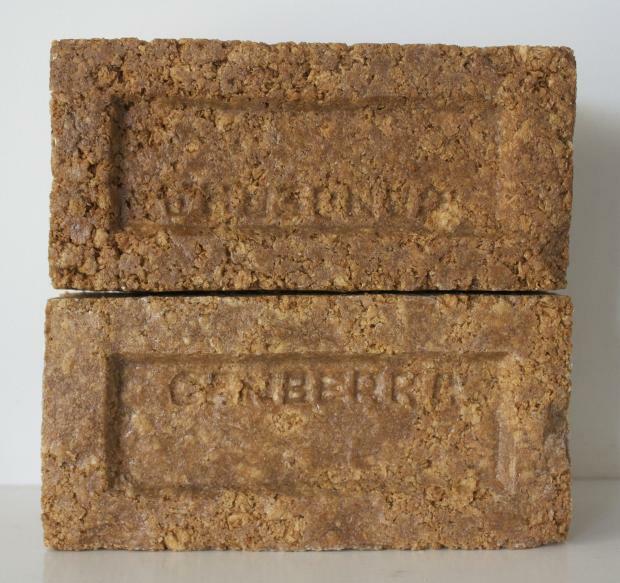 Our ‘national foodstuff’ is presented to us now as the ubiquitous house brick, some identifiable as convict bricks from NSW and the famous Canberra red brick. These new objects prompt examination of a Weet-bix commercial reading of Australian identity, and there are not many leaps to be made between Hall’s bricks and her perception of nationalistic constructions both literal and figurative. The cereal will never be looked at in the same way again, nor will its sunny jingle. A brick is a symbol of order and progress, containment and control. Aussie kids are Weet-bix kids. Is this how we identify ourselves? Does it fit who we really are? Has it ever? The constructed identity, like the constructed wall, is divisive and resistant to change, breeding intolerance, fear and protectionism, obfuscating truth. For everything a wall keeps out, be it real or perceived, something else is kept in. Shelter Object embodies mainstream ideals of security, unpicking a desire for safety sought out and clung to as a by-product of fear and distrust; safety in numbers, safety in conformity and alignment with approved archetypes. The illusion of safety is an illusion in and of itself, meanwhile suspicion and fear balloon unchecked behind closed walls, isolated from external influences. Which threat is more real, more damaging? Perhaps the only real security is to be found in the generosity and care of community – it is in the shelter of each other that the people live – and it is interesting to learn there is an alternate translation of the saying, being: we live in each other’s shadow. The Gaelic word ‘scáth’ can be taken to mean shadow and shade or shelter and protection. These readings are as changeable and ambiguous as our relationship to one another, so easily skewed by a culture of fear. Only by relinquishing fear and suspicion are we open to creating meaningful connections; by reaching out our hands to a stranger we can build something truly strong. Walls down and lines blurred we are more able to accept that the potential for the best and worst of humanity is latent within each one of us. When we rule what we are or are not as a nation we forgo the opportunity to imagine what we are capable of or what we might become, of what we can do for one another.